Founded in 2003, Meeting of the Masters provides an opportunity for a rare experience - to witness the talent of the world’s most respected master faux and decorative artisans at one time and in one place. Due to popular demand throughout the industry, Faux Effects International™ is bringing back the event in 2007 with plans to host a Meeting of the Masters™ gathering in a unique cultural arts setting, every two years thereafter. The Addison Conference Centre, located in a park setting in the heart of Addison, TX, provides an idyllic setting for a memorable experience. Faux Effects International™ is hosting an event that is like no other. Although exhibitors and presenters are by invitation only, the doors are open to professional faux and decorative artists as a development experience in their career path - an opportunity to further their skills through up-close contact with masters in the field. Old World and contemporary finishes achieved through state-of-the-art materials and application techniques will be spotlighted throughout the two-day event. Additionally, topical presentations will provide attendees with in-depth knowledge regarding a variety of popular subjects including trompe l’oeil, murals, marbling and wood graining. 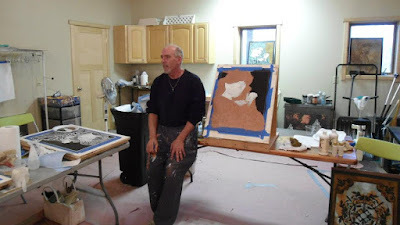 Admission is "free", simply bring your commitment to advance your understanding and awareness of the art form, and uncover inspiration for faux finishing and decorative painting. Meeting of the Masters™ is a not-for-profit event that was conceived as a gathering of fine and decorative artisans to provide an educational forum that celebrates the industry and inspires professionals to continue their education in faux and decorative finishing, bring their skills to new levels and optimize their potential for success in the industry. While all industry professionals are invited to attend the event, exhibitors and presenters are invited to participate based on their expertise, experience, communication skills and reputation in the field.